Some days I feel like I just clean up the same messes over and over again. 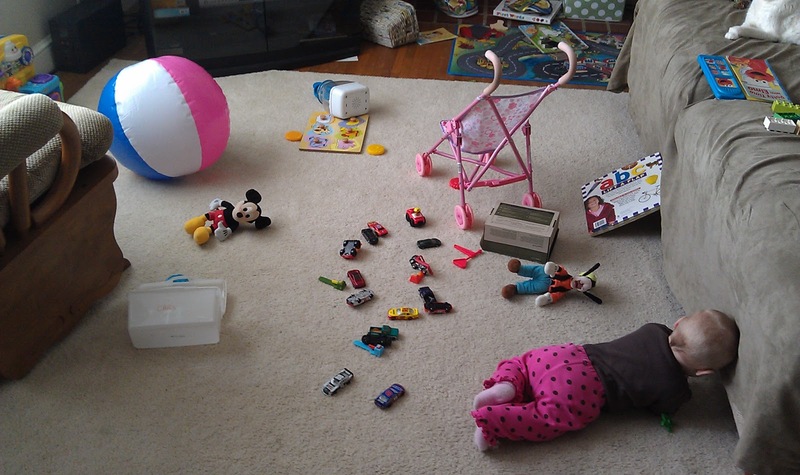 I know this is the plight of stay-at-home parents worldwide. One of the moms in my mom's group likened life at home with her newborn and toddler to "Groundhog Day" -- the comedy where Bill Murray keeps reliving the same day over and over again. Yup. That about hits it. So that's where the baby got to. What you say? It's just a towel on the floor. 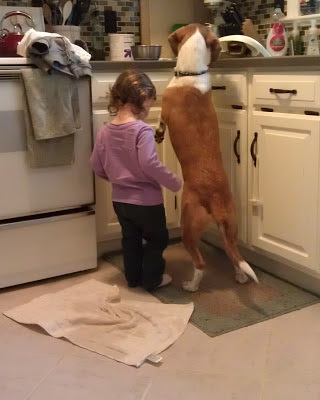 The towel is covering up the water that was spilled from the silver bowl on the counter that Lily was attempting to offer to Snacks who wasn't interested in it as much as the lunch (not pictured) that Lily neglected to eat for reasons I'll explain in a moment. Why was there a silver bowl full of water sitting on my counter? you might be wondering. It's one of the dog and cats water bowls put on the counter to prevent Jovie -- who crawls all over the house making her own little messes here and there -- from spilling it all over the kitchen floor. As you can see there is no winning. 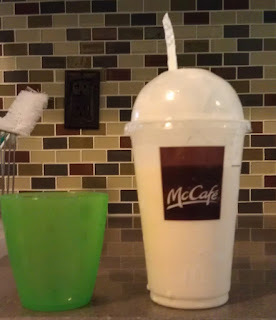 At right is the "small" vanilla milkshake I bought from McDonald's to curry favor from Lily during an errand we had to run today. The reason I put the word "small" in quotes should be obvious. 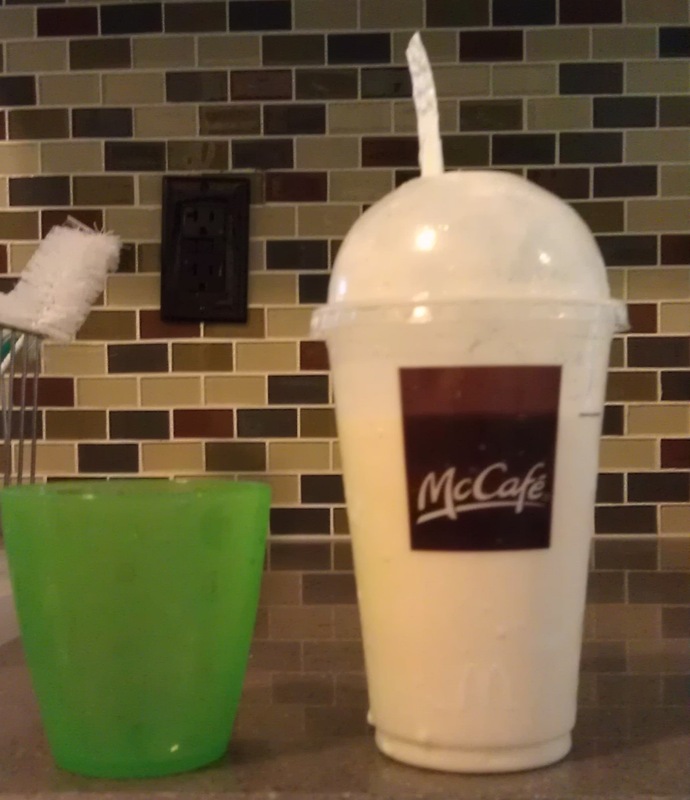 I put the unquoted small green cup next to the "small" milkshake to give you an idea of what my vision of small is. 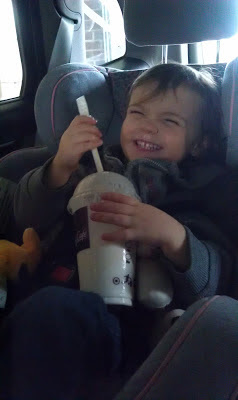 Anyway, I found myself yelling at the "small" vanilla milkshake while driving home. "Really, McDonald's?" I shouted. "That's a small?! What reality do you live in where that is a small?!" 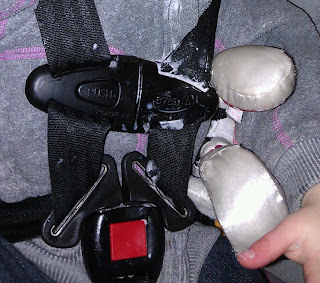 On the bright side, a milkshake-encrusted carseat is adding a little novelty to my daily cleaning regimen. Perhaps the Groundhog Day spell has been broken!